(b Galway, 12 Dec 1940; d Galway 27 April 1988). Sr Anselme was the youngest of 7 children, born into a poor family in Galway city during the Second World War. Sr Anselme entered the enclosed community of Carmelite Nuns in Loughrea, Galway, at the age of 16, and remained there until her death. Over the course of her life she became responsible for all aspects of music within the convent and raised the quality of the nuns’ singing to a very high standard. Her organ playing was considered particularly fine. In 1972 Sr Anselme came to the attention of the producers of “In the Footsteps of Hildegard”, a radio documentary series which focused on music-making by nuns in enclosed orders. The documentary was commissioned by National Public Radio in America, and produced by a team headed by musicologist Dr Judith Schäfer and anthropologist Verena Shaw. 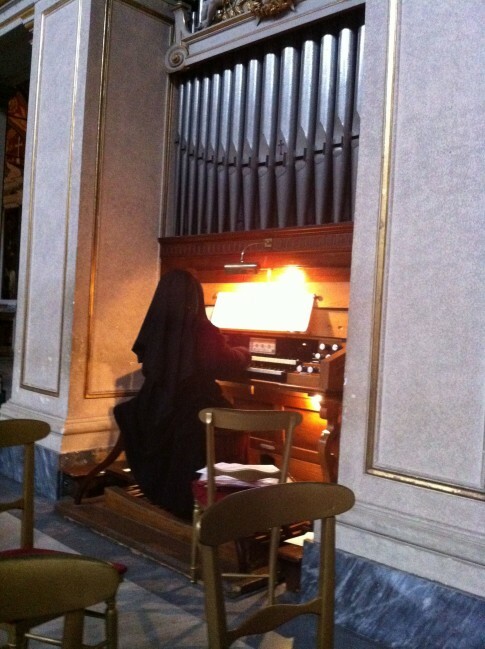 In late 1972 the team traveled to Loughrea and made various recordings, including two of Sr Anselme performing the compositions for organ she called Virtue II and IV. According to notes made by Schäfer, Sr Anselme considered her “Virtue” compositions a form of contemplative prayer. She composed and performed them for herself alone and did not normally perform them for the other nuns in the order. The Virtues are quite long in duration, and focus on incremental changes in organ stops. They are regarded as unique examples of drone music composition in Ireland. Virtue II (excerpt) by Sr Anselme O’Ceallaigh. Performed by Sr Anselme O’Ceallaigh. Virtue IV by Sr Anselme O’Ceallaigh. Performed by Sr Anselme O’Ceallaigh. Schäfer, Judith “Hildegard’s Legacy: The Contemplative Organ ‘Virtues’ of Sr Anselme O’Ceallaigh” in The Journal of Feminist Musicology, January 1974. This entry was posted in Drone, Improvisation, Women. Bookmark the permalink.